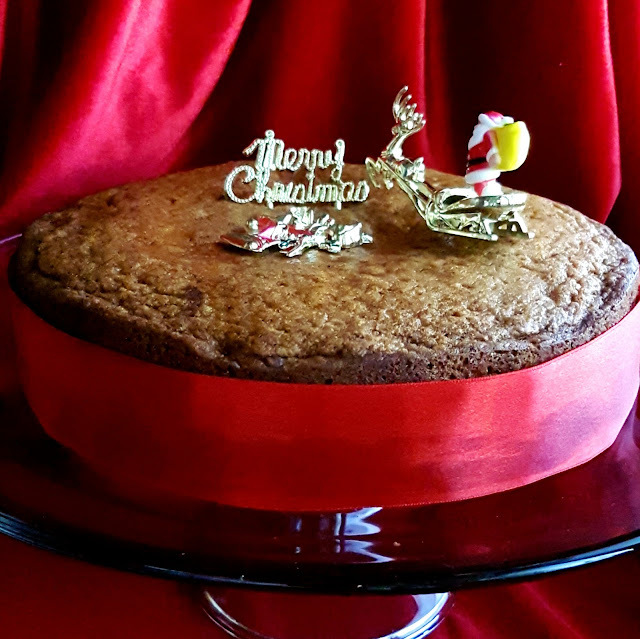 Plum Cake dressed up for Christmas! My love for plum cake is only a recent thing. Never had much fascination for it as it has loads of raisins and am no raisin fan. 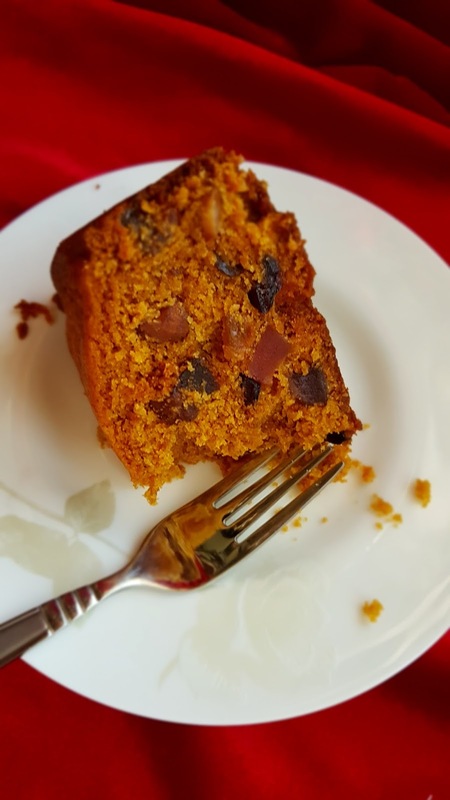 The store bought ones is loaded with raisins maybe to make it more economic.This is a common tea time snack in almost every home at my native and yes a Christmas special. Some households consider the plum cake superior to other ordinary bakery snacks and take the pride in serving it to their special guests. This cake preparation begins a year ahead in the Christian households. The dry fruits and nuts are soaked in alcohol just after Christmas for the next year's Christmas. As alcohol is used in their cakes, it can be stored and matured for a long period. As I cant use alcohol followed the fruit juice method. Also I made it without pre soaking, but tried to soak it for a couple of hours.Hence used the cooking method. You can soak for months if you wish to but in the refrigerator as juice doesn't act as a preservative as alcohol does. This cake tastes great after a day or two of baking. It can stay at room temperature for a week or more if handled sterile. 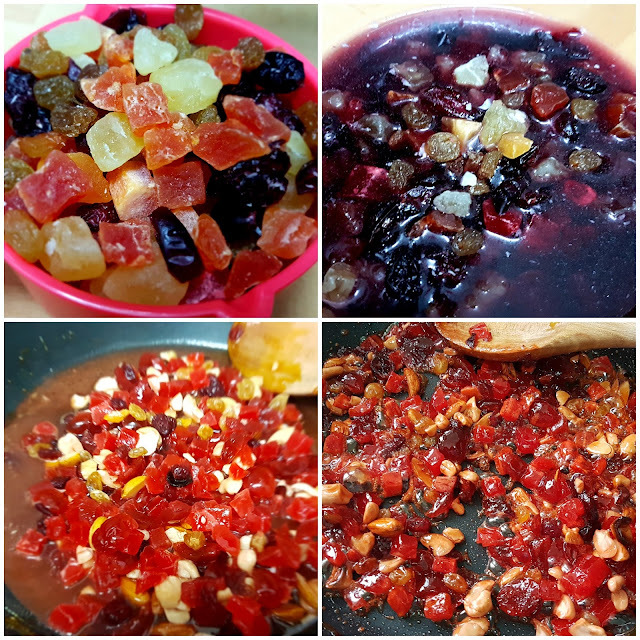 Soaking of dry fruit & nut mix and preparation of it for the cake batter. Soak the dry fruits and nuts in the fruit juice for at least 2-3 hours.You can also soak it overnight or for 24 hrs for better results. 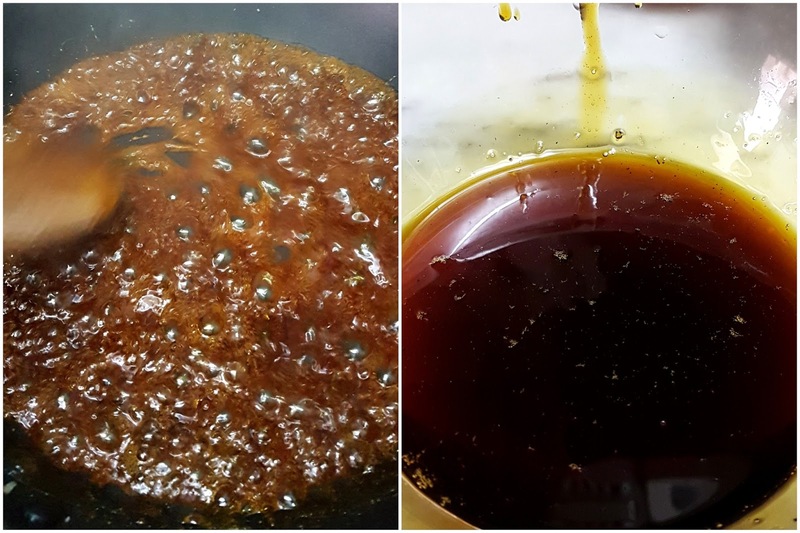 Once you are ready to prepare the cake batter, take the soaked fruit and nut mixture along with the juice in a nonstick pan and cook it until all the juice is gone. Remove from heat and let it cool. Once cooled, the dried fruits and nuts will be sticky and messy to handle. Separate and break any lumps or masses formed. Coat it with the flour to prevent it from sinking into the bottom of batter. Preparing the caramel Syrup :Melt the sugar gently swirling the pan(you can add a tablespoon of water with sugar to speed up the process but I just took the sugar alone). After the sugar is completely melted it would start changing the color from transparent to light amber to dark amber. The caramel is now ready so lower the heat to prevent it from burning. Now add the half cup water gently as it can splash and can be dangerous. Keep stirring to dissolve the caramel in water. Remove from heat and keep aside to cool. Prepare a round 9" pan by greasing and dusting with flour or line with parchment paper. Sift all the dry ingredients into a bowl and keep aside. Beat the softened butter and sugar until pale and fluffy for about 6-8 mins. Add in the egg yolks one by one beating in between. (Remember to separate the eggs, its mentioned in the ingredient list).The batter may look curdled at this point. Now add the caramel syrup and the zest, beat until just mixed. Add in the sifted dry ingredients part by part mixing in between. Take care not to over mix. Take another bowl, beat the egg whites adding a pinch of salt and beat just until stiff peaks form. Fold in the egg white mix gently into the cake batter. Finally fold in the dried fruits and nuts reserving about a 1/4th of it. Pour into the prepared pan and level it using a spatula. 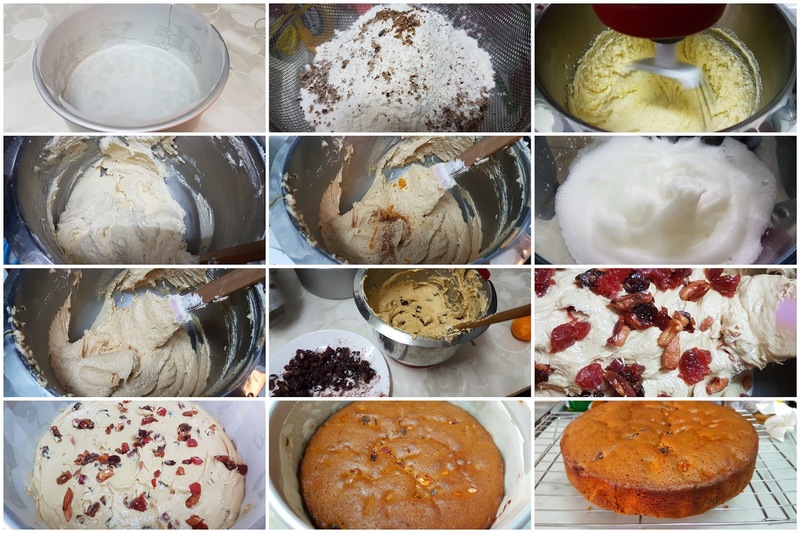 Finally sprinkle the reserved fruit and nut mix over the top of the batter. Bake for about 50- 60 mins until a toothpick inserted comes out clean. Cool the pan for few minutes. Then flip onto a wire rack and let it cool completely. You can just drain the soaked fruits and nuts and use it if you are pressed for time. But cooking can soften the fruits and nuts as we have not soaked them long enough. Eggs can be added directly as such without separating into the batter. I folded egg whites separately to give the cake a lighter texture.As the cake is packed with fruits and nuts it will naturally tend to be denser. The baking time can increase or decrease depending upon the pan and oven used. As the cake is denser than the normal sponges it takes time to bake. If you find the batter on top unbaked but the sides done after 30- 40 mins, you can cover the pan with aluminium foil and place back into the oven. Plum cakes tends to dry out. So once cooled, store it in a airtight container. You can use either orange or grape juice. Each gives the slightest hint of its distinct flavor to the cake. Tried this. Awesome cake. Always better the next day. The cake finished off in a day. Thanks a tonne for recipe. I used a tsp vanilla essence instead if zest. An Easy Microwave Date Cake...a successful experiment.